The After Hours update for GTA Online has been mostly well-received. The new nightclubs are fun, the hidden Easter eggs are cool, and the new music is a great way to make GTA Online feel fresh. But some fans seem less excited about—even angry at or afraid of—the future of GTA Online. Specifically, players seem worried about two upcoming but not-yet-officially announced vehicles that they fear might ruin the game’s free roam sessions. While some players are worried about the upcoming B-11 Strikeforce combat jet, the biggest amount of anger seems focused on the Oppressor Mk. II, a futuristic and sleek-looking jet bike that will be armed with missiles and counter defense systems. The reveal of this new vehicle came from super fans like TezFunz, players well known in the community for digging into GTA Online’s code and files to find new content, unused assets, and cut features. Once the After Hours update was downloaded by players, these super fans start pulling apart the files to find new information. A lot of content in GTA Online, including the new After Hours businesses and missions, take place in public free roam sessions. Rockstar doesn’t allow players to do business missions in private or friends-only free roam lobbies. The original Oppressor in GTA Online had a reputation as a vehicle often used by trolls to attack random players in free roam, blowing up their cars or supplies in the process. This new Oppressor is faster and more agile, making it harder to hit, and will be equipped with better missiles and machine guns. Even more worrying is that The Oppressor Mk. II will have counter-defense systems that can jam missiles, making it harder to hit the new jet bike. This could spell a lot of trouble for free roaming players when the trolls get their hands on it. Updates in GTA Online usually come in one big download, and then content is spread out over a few weeks or months. Fans usually refer to this as “drip feeding.” Super fans found that upcoming new “drip feed” vehicles included The Oppressor Mk. II, along with other, less controversial, new content. While this content hasn’t been officially announced, Tez and other fans have a good track record with this stuff. For example, last week FoxySnaps and other fans revealed that a blimp was being added into the game, and just this week that blimp is now available. Once these hackers and data miners started revealing new information, fans started reacting. When the Oppressor Mk. II was revealed, the reaction was negative and frustrated. 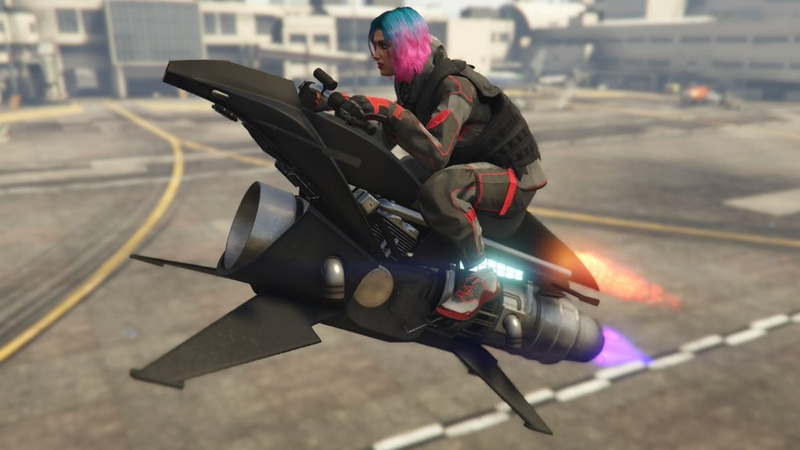 Some players feel the new jet bike is too wacky or futuristic for GTA Online. Others are concerned that the new Oppressor Mk. II will make free roam sessions impossible to play in. There is also the feeling that Rockstar isn’t listening to its community about this issue. Fans have long been worried about weaponized vehicles becoming too powerful and ruining free roam lobbies. This new Oppressor feels like it is only going to make this problem worse. In the past Rockstar has made changes and added things based on community feedback, so some players are hoping if they share their concerns on Twitter and Reddit Rockstar might weaken the upcoming jet bike. Of course all of these reactions are based on an unreleased vehicle. Rockstar could delay the bike, never release it, or change it dramatically to make it less powerful. Until the Oppressor Mk. II is actually available in game, fans will just have to worry and wait.